After negotiating throughout 2017, the QTU has succeeded in securing a more streamlined application process for experienced senior teacher. provide one example for each of the two areas to give a specific understanding of how the duty is performed or outcome is achieved. The expected length of response per criterion is 200 – 250 words. This streamlined application should reduce applicant workload and aligns the application to the Professional Standards for Teachers. This comes on top of a reduction in the years of service required before a senior teacher is eligible for experienced senior teacher (EST), which was secured as part of EB8. Since 1 July 2017, there has been a one-year decrease in service period ending in 1 July 2018, because of which senior teachers will need to have completed two years less service to be eligible for EST (see table). This reduction in service requirement will not only have a positive outcome for members in the immediate term in the form of further classification progress and salary increase, it will also have a compounding positive effect on superannuation as well. For those members who have applied, outcomes of EST panels will be released during term three. The department’s goal is to have everything finalised and all applicants contacted by 29 June. However, it is important to keep in mind that this will be dependent on the capacity of panels to process the vast number of applicants. If you are unsure of your eligibility for EST, either this year or for the coming round in 2019, please contact the department’s Teacher Classification Team at tct@det.qld.gov.au. It will be helpful if you provide your name, payroll ID number and a brief explanation of the purpose of your enquiry. reduction of the three-term engagement requirement for temporary teachers to access senior teacher (due to the department’s employment practices, an eligibility requirement of at least three terms is arguably prohibitive to members in accessing the classification and would have ongoing ramifications from the perspective of a teacher then accessing experienced senior teacher). 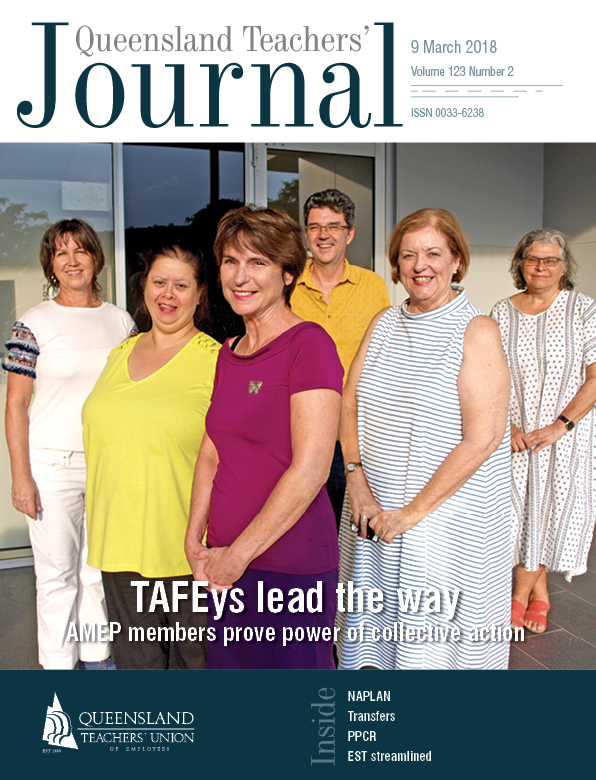 As the end of the year loomed, it became apparent the changes to eligibility requirements that the QTU was seeking were unlikely to be achieved through the negotiation process. Senior department officers had communicated that the likely cost of the change to the budget would be significant. This would require subsequent modelling and possibly Cabinet approval. As a result, it was agreed that negotiations over the senior teacher review would be pursued further in the context of EB9 in 2019.